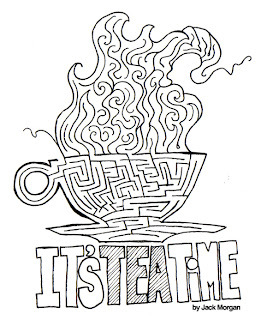 I think it's better to start this Tea Cup Maze at the handle so that you're going left to right, unless you're left-handed, and you can solve this moving right to left. That's what I was thinking about when I did this. I also thought maybe you could have a tea at my wife's tea shop when it opens back up after a year-long expansion and find this on your table and solve it while you drink. Wouldn't that be a nice way to spend a few minutes? 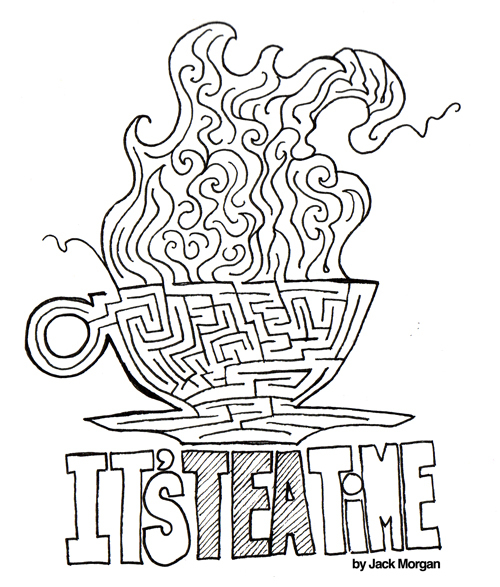 This should take less than 60 seconds to solve, so you could finish it while you waited for your tea to steep or while you waited for it to cool down to the temperature you prefer. Anyway, this is another maze I did. It's part of the book I've been working on. I hope that you click on it, get the bigger size, and print it out and solve it. If you have fun doing those things, please let me know. Is that supposed to be an opening on the top there? I'm guessing you just got too close there. Anyway, cool puzzle. hey, I've been gazing at it now, and I can't see the opening you're talking about. hmm. There's the exit or entrance at the top right, but that should be obvious. I can't see it. I will look for five more minutes at it and give up.